Investigations into the attacks at six different locations across Paris Friday night have led French authorities on a manhunt and into an early-morning raid filled with gunshots and explosions, according to The Guardian. In the chaos, authorities identified the two men whom they believe orchestrated the attacks, which killed 129 people. Senior intelligence officials told The Washington Post that one of the men was killed in the raid. Wednesday updates on the Paris attacks name some suspects, while adding to confusion about just who was and wasn't involved. The attacks in Paris were planned and carried out by terrorists acting on behalf of ISIS. There were eight people physically involved in the attacks — six blew themselves up, and two died in shootouts with police. The last suspect, Salah Abdeslam, is still on the run. His brother Ibrahim was one of the suicide bombers, and blew himself up outside of a restaurant in the 11th arrondissement. Abdeslam's other brother, Mohamed, was taken into custody by police, but was released after several hours of questioning. He has denied any involvement with the attacks, and said that he had no idea that his brothers were planning such an attack. Here are the latest updates about the Paris attacks, with new information that investigators know for sure and mysteries that are waiting on answers. Authorities found a Syrian passport near the body of one of the Stade de France bombers, leading them to believe that one of the attackers may have posed as a Syrian refugee to gain entry into the European Union in October. A source close to the investigation told the Agence French-Press Tuesday that the passport actually belonged to Ahmad al-Mohammad, a soldier in the Syrian Army who had died months ago. This led authorities to conclude that the passport was either stolen or was fake. It's still unclear whether the passport was used by al-Mohammad or someone posing as him to register as a Syrian refugee in October. Thomas de Maiziere, the German interior minister, said it was more likely that the passport was simply left at the site of the bombing as part of ISIS' plan to make people fear and reject Syrian immigrants. 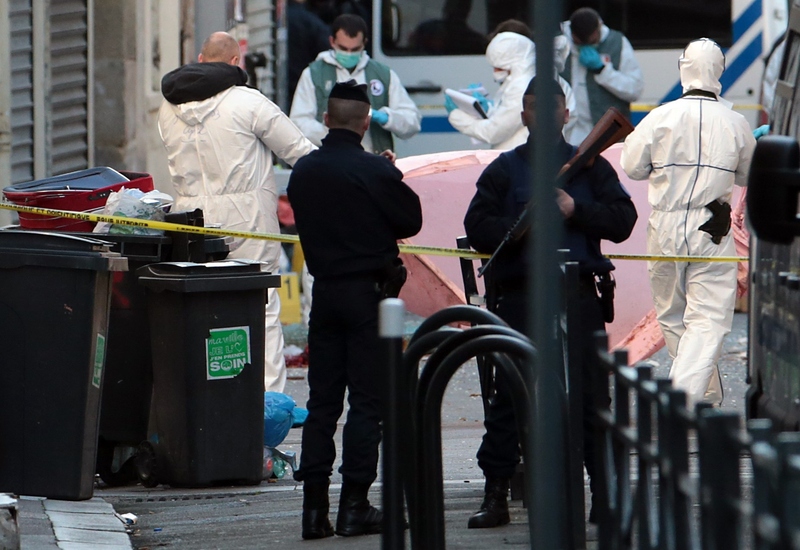 Additional evidence was found Wednesday in a trash can near the Bataclan concert hall, where 89 people died. Authorities found a discarded mobile phone which they believe was used by one of the Paris attackers. The phone contained a text message which read "On est parti on commence," which means, "We are starting." Early Wednesday morning, residents living in Saint-Denis, a Paris suburb, awoke to the sounds of gunfire and explosions that shook buildings. A seven-hour police raid on an apartment in the same neighborhood as the Stade de France ended with the deaths of two terrorists: A woman who blew herself up, and Abdelhamid Abaaoud, the Belgian national whom authorities believe to be the mastermind behind the Paris attacks. Senior intelligence officials close to the investigation told The Washington Post Wednesday that Abaaoud, who also goes by the name Abdel-Hamid Abu Oud, was killed during the raid. French prosecutor Francois Molins held a press conference Wednesday, and said that terrorists fired 5,000 rounds at police during the raid, and that five police officers were injured. Police arrested seven additional people, but have not released the identities of any of them. During the press conference, Molins also said he could not confirm who had been arrested, or whether Abaaoud was dead. Molins said that the apartment had been Abaaoud's safehouse, and that he had been planning another attack in Paris. Police did not find Abaaoud in the apartment after the raid, but they used DNA tests on body parts Wednesday afternoon to determine whether he died when the woman blew herself up. According to the officials who spoke to The Post, forensic experts concluded that he had died. Counterterrorism agencies in Europe and the U.S. have suspected Abaaoud for some time, and he was targeted by French airstrikes in Syria last month. Authorities believe he has close ties to ISIS leader Abu Bakr al-Baghdadi, and was probably linking top ISIS leaders to small ISIS factions in Europe. Abaaoud had apparently traveled back and forth between Europe and ISIS-held cities in Syria, which worries officials, who wonder whether other ISIS militants could be doing the same. Investigators also said Wednesday that Salim Benghalem ordered Abaaoud to carry out the attacks in Paris. Benghalem acts as a sort of supervisor for French jihadis-in-training who travel to Syria to train and live with ISIS. He is believed to be living in Syria. The eighth perpetrator of the attacks in Paris, Salah Abdeslam, is still missing as of Wednesday. Police released his photo and description to the public shortly after the attacks. Two Paris-bound Air France flights were diverted late Tuesday because of bomb threats. One of the flights, which departed from Los Angeles, landed in Salt Lake City, was inspected by Canadian and U.S. authorities, and given an all-clear. The second flight, which left Washington's Dulles International Airport, was diverted to Halifax, Nova Scotia. It was also inspected, but there has been no additional information given about the inspection as of yet. The flights were diverted after calls to an Air France reservation center. An official familiar with the investigation couldn't tell CNN whether the calls came from the same person, but they did say that they were unaware of strange activity onboard either plane. French President Francois Hollande announced Wednesday that France would still stick to its pledge to take in 30,000 refugees over the next two years. He said that each one would be thoroughly vetted to make sure they do not pose a threat, and he acknowledged that they are fleeing the "very same people who are attacking us today." Their attacks bloodied Paris and St.-Denis, but it is the entire country that has been attacked.